Literature Holders Keep Your Reading Materials Organized! What is the best way to organize brochures and flyers while attracting customers? 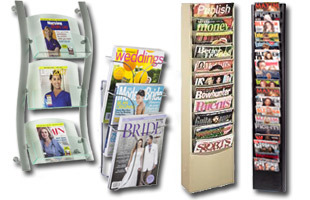 Literature holders, often referred to as magazine racks, make it easy for an audience to see and take your paper advertisements. These pamphlet stands are attractive and functional in any environment. 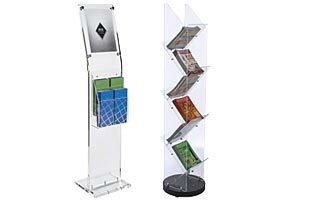 Our inventory of literature holders are made from acrylic, wood and other modern materials, and are great for displaying books, literature, flyers, magazines, promotional offers, employee handouts, etc. Many of our magazine racks are easy to transport from one showcase to another. 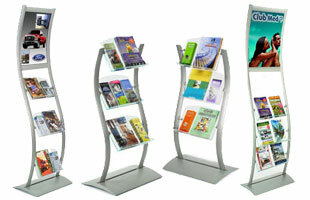 Some of our literature holders, such as the free standing catalog racks, are designed specifically for trade show use. 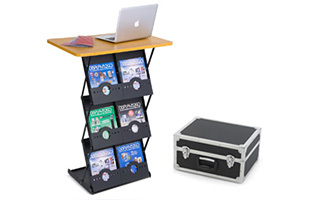 These pamphlet stands include a case for carrying the easy to collapse stands. 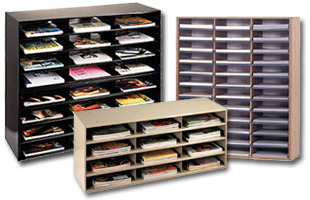 Our literature holders are all carefully manufactured in our facility located in Fall River, MA. 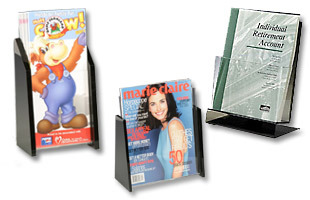 Choose from our large selection of In Stock & Ready to Ship magazine racks that include acrylic sign holders as well as plastic brochure holders. These are available in a single frame with brochure racks or business card holders and also as multi panel sign holders or literature holders. 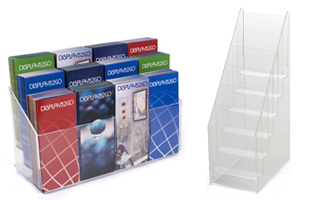 These acrylic pamphlet stands also come in styles such as vertical, angled or table tents. To find the right magazine racks that meet your point of purchase display needs click on a category or image above. Business complex lobbies keep all of the companies' business cards in one large rack for clients and potential customers to take. This practice allows businesses to cross sell because every business card is readily accessible. 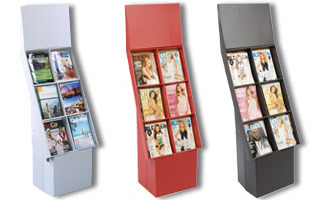 Retail and periodical utilize magazine racks to advertise their selection of magazines, newspapers, books, and other print media. 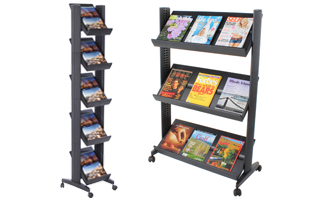 All of the stands have different pocket styles to organize all of your periodicals in any fashion imaginable with wall mounting and floor standing displays. Restaurants will place pamphlet stands on the host station countertops or dining tables. These displays can keep drink specials, take home menus, or any other important message for your clientele. 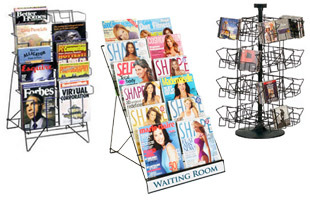 Magazine racks are ubiquitous in sporting and outdoor camping stores that keep brochures for different recreational parks, sporting facilities, and gyms. Customers can take a brochure at their convenience as they depart. Are there customizable literature holders? Acrylic pamphlet stands are available with your customizable logo or slogan. Our warehouses manufacture these models and add your personalized graphic with one, two, or three silkscreen colors. Slatwall designs let the user control where all of the racks attach. Baskets, racks, acrylic bins, and other containers are available. Choose to put children's books closer to the ground level, while putting classic novels toward the top. The possibilities are limitless. Depending on how you want to organize your merchandise, it may be more convenient to have a table top display or a wall showcase. There are brochure holders in this collection that have the capabilities to function on a tabletop and a wall. These models are extremely versatile. Magazine racks in this collection include poster frames for your larger graphic announcements. These models come in both wall mounting and floor standing styles. Attract customers to your brochures and flyers from a greater distance with your posters. 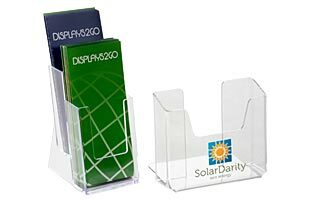 Some of the most popular and affordable models are conventional, clear acrylic brochure holders. When you think of pamphlet stands, generally these are the items that come to mind. 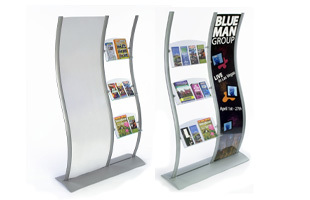 Everything from tri-fold brochures to flyers to magazines can fit in these literature stands. These magazine racks feature many different pocket amounts and arrangements. Literature stands can have up to 24 different holders. There are even items with an easel design to accommodate one brochure. Poster displays benefit from literature holders. Customers can take a reminder of your advertisement with them. Attach acrylic literature holders to our metal poster frames either beneath or next to the large graphic. Pamphlet stands can also be attached to cork boards. 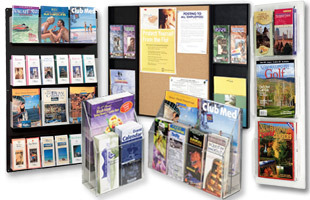 The combination of the acrylic brochure display and bulletin surface is sure to garner more attention to your message. 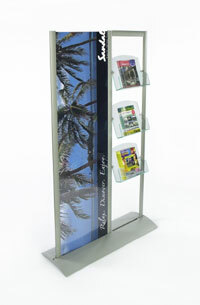 Displays2Go.com specializes in magazine racks that can adapt to any situation or merchandise. The goal is to provide the user with the most options imaginable. 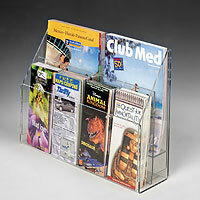 Our most popular pamphlet stands allow the user to choose between having 12 magazine pockets or 24 brochure cases. Simply remove or add the acrylic sides to adapt the showcase to your specific needs. These literature holders attach to almost any wall with the included anchors and mounting equipment. Utilize many tiers to keep your more popular periodicals out front. Many of these holders for literature can be used on a tabletop and wall. The clear fronts keep the periodicals in the customers' line of sight, while the acrylic exterior is extremely durable. 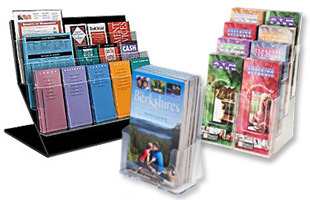 These pamphlet stands are effective, long lasting, and priced economically. 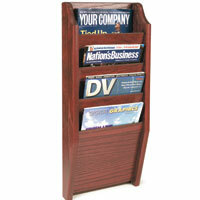 For slightly more upscale magazine racks, try our wooden exterior models. These literature holders, like the acrylic stands, can mount to the wall or stand on the floor. Match the overall décor of your environment with oak or mahogany finishes. Wall mount designs comprised solely of wood feature four, seven, eight, ten, fourteen, or twenty pockets. For smaller showcases, designed for counter or table top displays, there are a variety of different sized wooden racks with acrylic fronts. The sizes of these magazine racks vary with the desired contents of the displays. The business card containers are three tiered with three to nine holding areas. Other wooden showcases of this style are suitable for newspapers, magazines, or four to eight brochures. 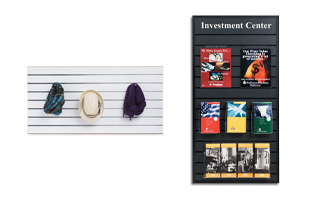 Our collection of wooden brochure displays includes slatwall and slotted displays. 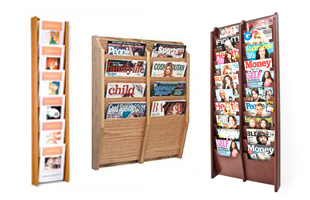 One of most popular magazine racks is our wooden slatwall model with double sided capabilities. This item makes books, flyers, and other periodicals accessible to audiences on both sides of the display. Three and four sided versions of these pamphlet stands are available in maple and black finishes. Slotted showcases are great when you need to keep track of numerous advertisements at once. These literature holders stand on any surface and feature any where from 12 to 36 different slots. 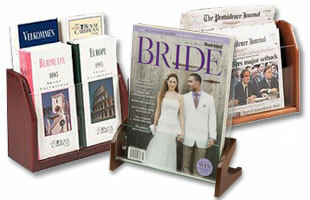 Keep all of your offerings organized with any one of these wooden magazine racks. Our catalogue also includes holders for literature with metal exteriors. These metal options range in style from conventional to modern. 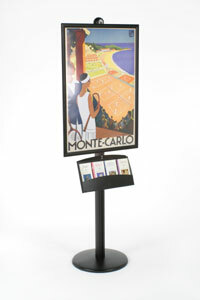 Wire metal brochure displays are available with black or silver polished exteriors for table or floor showcases. Some of the wire magazine racks are capable of spinning for advertising periodicals in every direction. These rotating stands are easy for the feeblest of consumer to operate. Traditional slat wall and slot displays are also an option in metal. More modern brochure holders include wave shaped pamphlet stands. These brochure racks are difficult for passersby and potential clients to ignore. 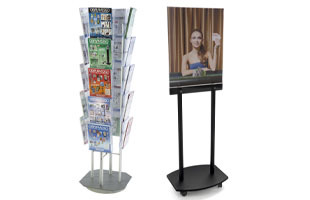 Available in wall mount and floor standing styles, these magazine racks are capable of advertising posters in addition to your selection of brochures. 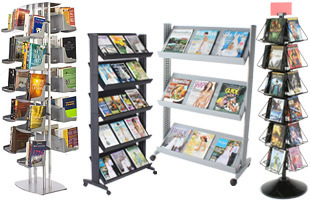 Whether your décor is more traditional or you are trying to create a modern environment, our expansive collection of magazine racks, brochure displays, and pamphlet stands is sure to contain the right item for you! See our selection of over one million different P.O.P. displays, trade show items, glass display cases, and lecterns and podiums available for purchase. We also have a huge selection of ballot boxes! Our main shopping page will point you in the right direction. Our warehouses have been manufacturing and packaging proprietary fixtures and marketing displays and graphics holders; all of which are inventoried "in stock" ready for same day purchase and shipping for over thirty years (est. 1974). Our company is a leader in this niche industry. With the evolution of on-line stores, a lot of "virtual" display houses have introduced themselves into the POP marketplace. These virtual display houses are nothing more than mere brokers, often re-faxing your purchase order to a real display manufacturer. As a broker, they loose control over quality and service. You, as the customer, are the one that suffers when virtual display house brokers pretend to be more than what they are. It is a simple point of fact that we (Displays2Go as the manufacturer) can provide better service during the whole purchasing-shipping transaction. Feel free to contact our customer service representatives at 800-572-2194 Monday through Friday from 9:00 a.m. to 4:30 p.m. EST. You are also welcome to use our unique "Live Chat" option by clicking on the icon within every page. 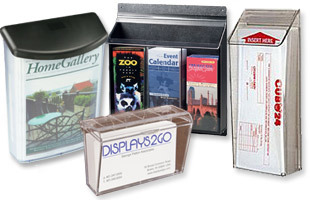 In addition, we offer a large selection of display products at our main page: Displays2Go. Remember for larger quantity needs, we can custom design a piece that meets your requirements-email customsales@displays2go.com! Buy from us today!